New Windows 10 operating system from Microsoft comes with Edge web browser as default option instead of Internet Explorer. Previous web browser from Microsoft was falling behind the competition and the decision to replace it with Microsoft Edge makes sense. Edge browser contains lots of features that were absent in Internet Explorer. First change you will notice with Edge browser is its flat interface, which is consistent with all other Microsoft software offerings of late. Being a relatively new web browser Microsoft Edge does lack certain features that you can find on other browsers like Chrome and Firefox, which is understandable and one can expect addition of new features with time. There is no extension support for Edge browser as of yet. You can’t add third-party extensions to enhance productivity in Microsoft Edge but it’s only a matter of time before they become an integral part of the Edge web browser. Below is a list of all Microsoft Edge features that you can use to improve web browsing experience. 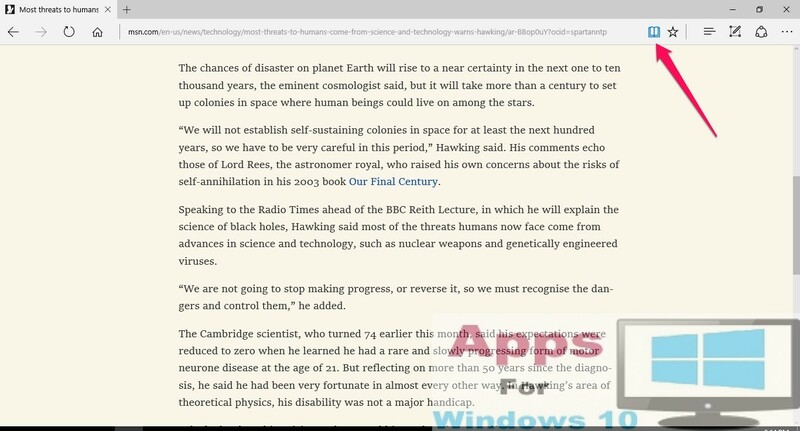 Reading view in new Edge browser presents web pages in simple manner by removing all extra pictures, ads, and links that interfere with reading experience. Here how you can enable reading view; first make sure you have the webpage open then click on the book shape icon on the address bar. This feature lets you edit webpages by giving you draw, highlight, crate notes and erase options. Use these features in Annotations to make changes to the webpage so that you can view them later for work purposes. Click on an ‘Make a Web Note’ icon located between share and hub buttons in toolbar for enabling Annotation feature. 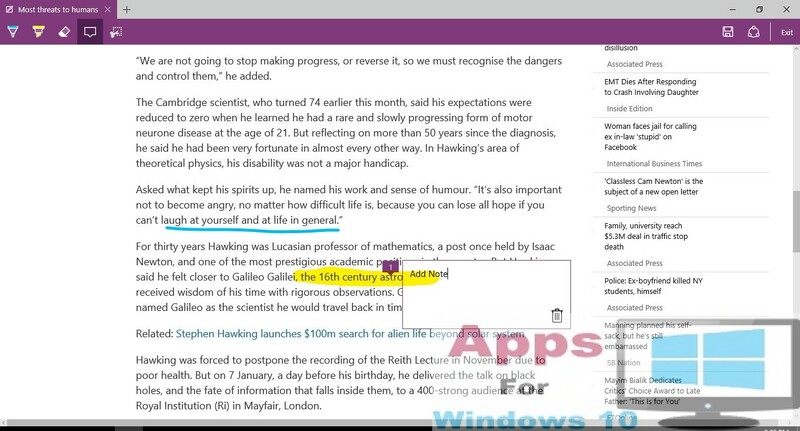 Save edited webpages on OneNote, favorites or reading lists and share them with others as well. Cortana is voice assistant has been added in the latest Windows 10 as the main search function. You can either use it to locate files and folders on PC or search information on the internet. Microsoft Edge has an in-built support for Cortana so that you can search anything on the internet via Edge browser using voice or typed search queries entered through Cortana. In order to ensure that Cortana works perfectly with Edge browser make sure it’s been activated on the system. 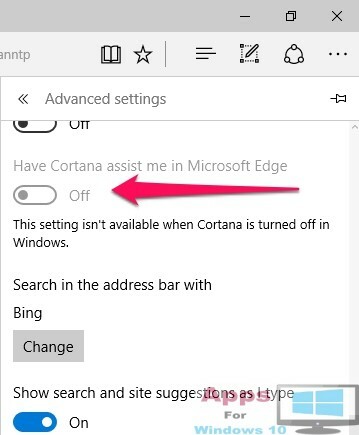 Enable cortana in Microsoft Edge by clicking ‘menu’ button (three dots on the top right corner of the window), then click ‘settings’, now scroll down to click ‘advanced settings’ and turn ‘have cortana assist me in Microsoft Edge’ option to ON. Just type anything you want to search in New tab window or where you enter webpage address and click enter for cortana to start the search. Lets face it, no one likes cluttered favorites bar because not only it gives a messy look but also take up screen space on the web browser. In Microsoft Edge you can create a reading of all articles or webpages in one place. Click on the ‘star icon’ in toolbar on the top right of Edge browser and select the ‘reading list’ from the drop-down window. Now to access webpages saved in reading list, click ‘Hub button’ (three horizontal lines) and select reading list option from the resulting context menu. Your favorites and reading list items are saved separately by Edge browser for easy access. 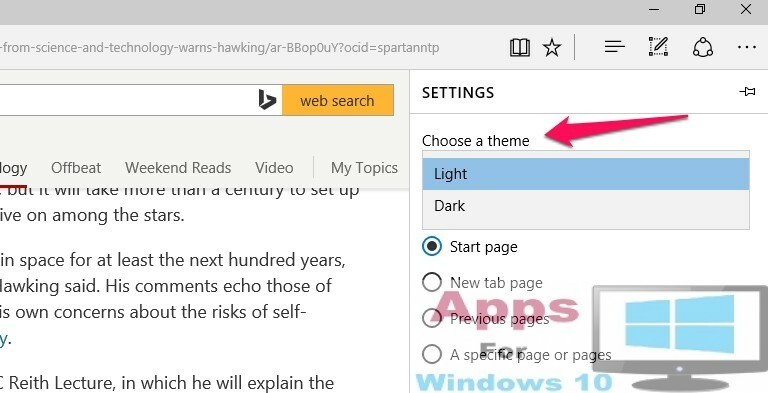 You can set both light and dark themes in Microsoft Edge web browser. Light theme is the default theme, however, if dark theme is your thing then click on the ‘Menu button’ represented by three dots on the top right corner of the window, got to ‘settings and select dark them option under ‘choose a theme’ option. In today’s interconnected world sharing is everything and the rise of social media has making sharing option in every app an almost a necessity. Microsoft Edge is not different, you can share webpages, web addresses, screenshots and links straight from within Edge browser by just clicking on a ‘share button’. You can add or remove app and services from share panel. Sharing app list won’t show apps not installed on the PC, so if you want to share something on Facebook make sure you have its app installed on the system. Microsoft Edge browser comes with pre-installed Adobe flash player for playing videos within the browser and it is switched on by default. But if you are skeptical of the flash player because of the security reasons then you can turn it off easily within Edge internet browser. Go to the ‘advanced settings’ by click on main menu (three dots on top right) and selecting ‘settings’ from the drop-down list. If you don’t want anyone else to get a hand on your browsing history then you use Microsoft Edge to perform all internet searching and browsing in a private window. When you surf the net in private session your history, cookies and all other internet activities remain anonymous and they are also not saved on your PC or web browser. Just click on the Menu button and choose ‘New InPrivate Window’ option from the list. You can transfer all favorites from Chrome or Internet Explorer to Microsoft Edge. Favorites from other Firefox and other web browsers are not supported yet. Click Menu then go to ‘settings’ and hit ‘view favorites settings button’ under ‘favorites settings’ option. Now choose the browser from where you want to transfer favorites from and click ‘import’ button. You can pin current webpage that is opened to the Windows 10 Start menu and on the task bar as a button for quick access. Similarly if you want to open a webpage in Internet Explorer then you can do so with a few simple clicks. Open the webpage, now click ‘menu button’ and select ‘pin this page to start’ or ‘open with internet explorer’ option from the drop-down list and its done.